As an expert for technical documentation, I can provide individual consulting on the questions specific to your project. I can either advise you only once, or I can continuously support you throughout your project. 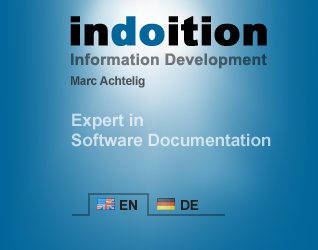 Do you want to write some technical documentation or software documentation and are looking for advice? Or do you already have some existing user manuals and help files that you want to revamp? Organized as a workshop, I can provide you with the necessary know-how, and together we can work out solutions to your individual questions. You can benefit both from my long-standing expertise and from my unbiased view to your project as an outsider. Depending on your requirements and questions, the workshop typically takes one or two days. If you’d like, I can also continue my support for some time after the workshop and provide continuous feedback on how to further optimize your work.